Cloned From An Original ’62 & Built To Vintage Specs . Please contact for light-weight Alder availability. 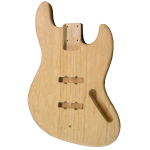 Light-weight Swamp Ash guaranteed under 4 lbs. When available, light-weight Alder guaranteed under 4.5 lbs. 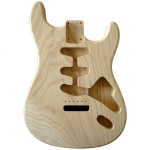 Are you intending to do a solid or translucent finish on this body? 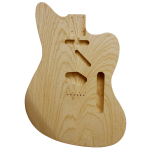 We HIGHLY recommend that all Paulownia bodies have inlayed hardwood inserts (maple or birch) in high stress areas such as the bridge, tremolo claw, etc. Would you like us to install these inserts for you? Contact for 1 pc. Alder availability! If so, skip the next few questions about pickup specs. 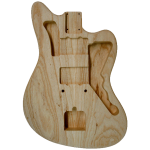 Based on the 1964 style, the jazz style guitar body shape features rhythm control circuit wiring, a vintage style tremolo rout and an offset waist. This classic guitar body would make an excellent replacement for any jazz or JM style guitar, vintage or modern. 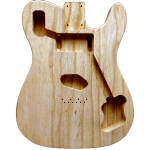 If you are seeking a build, the jazz style is fairly difficult to assemble, but provides a plethora of custom options. These guitars have been a staple of guitar music since its inception. 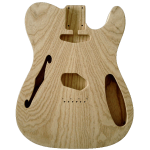 From garage to indie to surf, the jazz style body has graced the shoulders of some of rock music’s greatest players.